1Password's vault has many tailored shelves. Store your credit cards, reward programs, membership cards, and more. Never leave home without your important information again. Store your entire life in 1Password. Add bank accounts, passports, wills, investments, and more. Your life, secured by 1Password. Stop using sticky notes for private information you don't want others to see. Secure Notes let you store this information in the privacy and security of 1Password's vault. A single click opens your browser, opens a site, fills in your username and password, and logs you in. It's the fastest way to work or play. One click can automatically fill out long, tedious signup forms or shipping and credit card details when shopping online. Our Strong Password Generator is your key to password liberation. One click creates a strong, unique password for each account, and our browser extension fills it into the website automatically. For times when you need more control, change the password recipe. You can customize pronounceable words, special characters, and more. 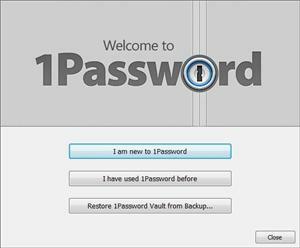 It's the simplest way to protect your self from password reuse, data breaches, and PML—Password Memory Loss. - Mark your most important or frequently used items for quick access and sync this list among all your devices. - Drag any mix of 1Password Logins, Secure Notes, and other items into folders for work, finances, social media, or any other grouping you need. - Adding tags to 1Password items is a snap; focusing on them to get things done is even easier. Our new service keeps you informed about your security. Watchtower securely checks your logins for known vulnerabilities and tells you which sites need new passwords. - 1Password for Windows has siblings for Mac, iPhone, iPad, and Android. We've got you covered. - 1Password for Windows syncs with your mobile devices through 1Password for iOS or Android. - 1Password supports Internet Explorer, Chrome, Firefox, and, for the first time, Opera.